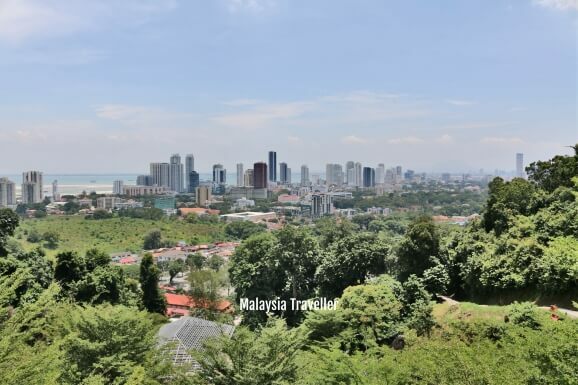 The new hilltop Arulmigu Balathandayuthapani Temple was opened to the public in 2012 and has great views over George Town. View of George Town from the temple. 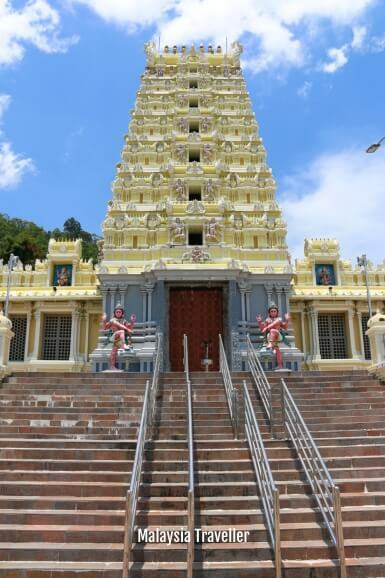 It is a Hindu temple and its main purpose is to serve the Hindu community of Penang but as a tourist attraction it has the potential to be Penang's equivalent of Batu Caves (though there is no cave here). 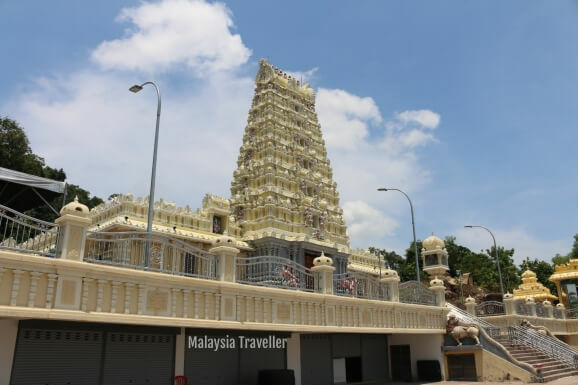 The temple's gleaming cream coloured seven storey gopuram dominates the hilltop and can easily be spotted from a distance away. It's a thing of beauty. 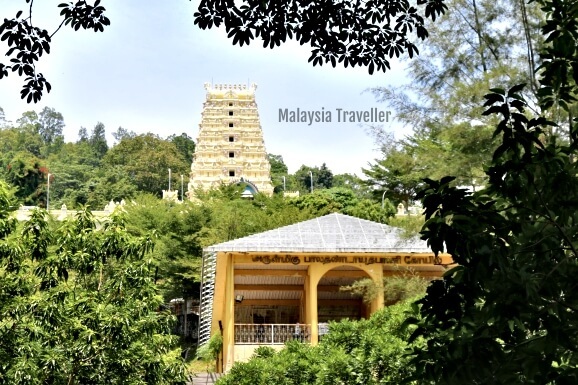 To reach there devotees and tourists have to scale 513 steps. 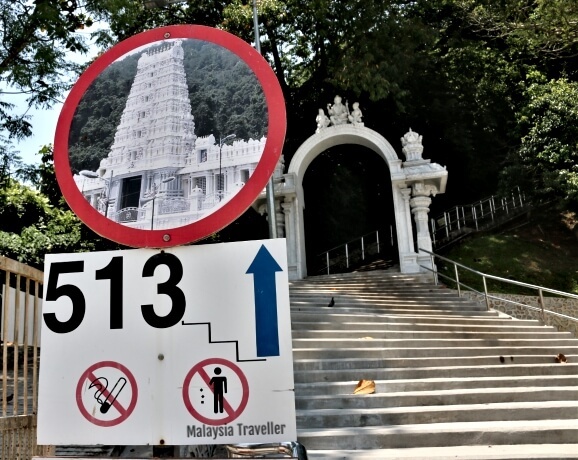 A separate flight of steps is provided for people descending from the temple so that there is a one-way system to ease congestion during peak periods such as Thaipusam Festival when as many as 700,000 devotees might be expected. 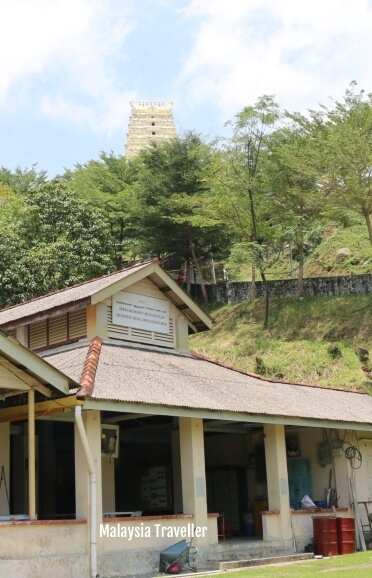 On the way up, visitors pass the old Dewan Arulmamani Arumugam Pillai which bears the date 1956 and there is another temple at this level, 30 meters below the new hilltop temple. 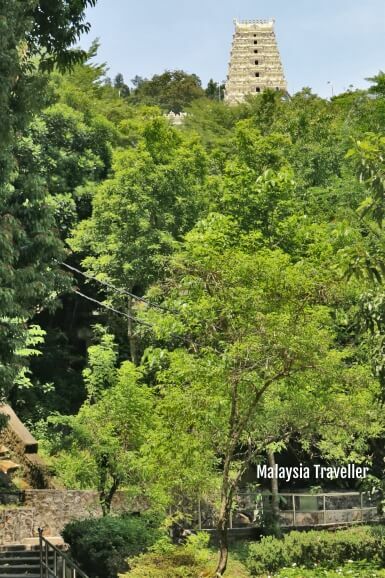 Originally there was a temple at the base of the waterfall inside Penang Botanic Gardens but it was shifted to this site in 1915 following construction of the Waterfall Reservoir. Yet another temple, Arulmigu Sree Ganeshar Temple, stands at the foot of the 513 steps. This one was constructed tin the 1950s and has been remodelled once or twice since. Temple Opens 6 am - 12 noon, and from 4.30 pm - 9 pm. 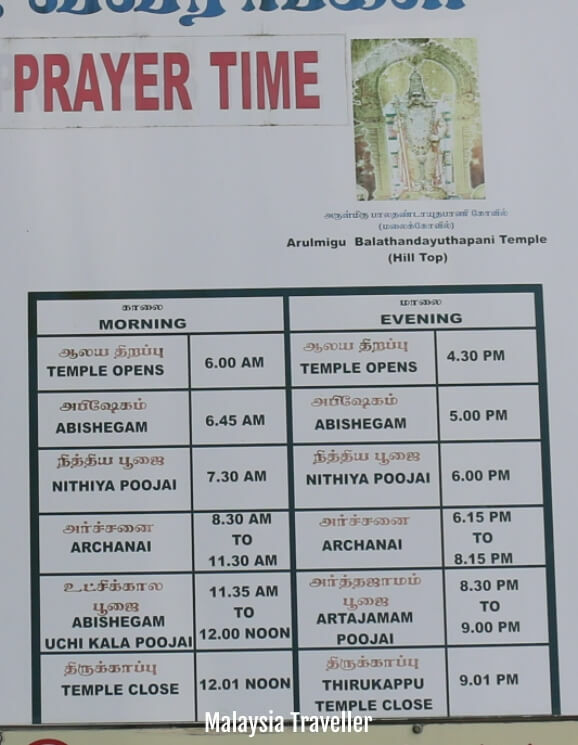 Temple Opens 6 am - 12 noon, and from 4.30 pm - 8.30 pm. Hindu devotees of course know how to dress appropriately. Foreign visitors are politely reminded that this is a place of worship and they should dress accordingly which means not too much exposed skin, i.e. long trousers or skirts are preferred. Shoes should be removed where indicated. Keep mobile phone on silent. No burning of candles or lamps on the staircases. No feeding of dogs, monkeys or birds.